Welcome to the end of the week here at SuperPhillip Central! 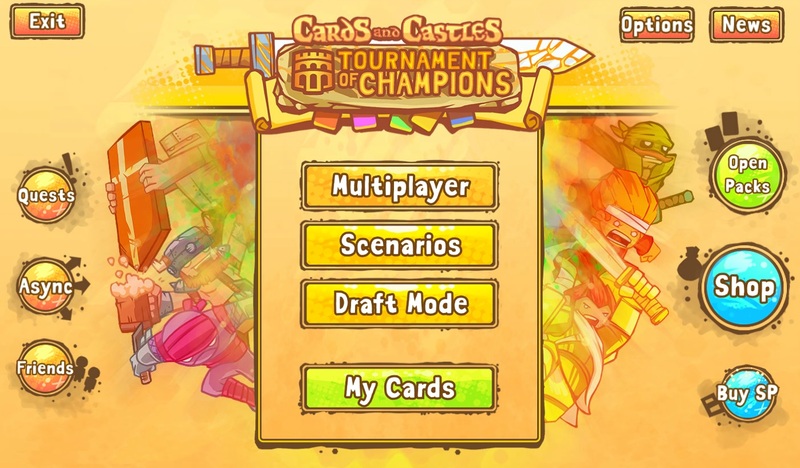 I have a treat for everyone today, a new interview subject with Matt Siegel., part of the development team of Cards and Castles, a digital card game as well as grid-based strategy title which officially launched on Thursday. During preparation to release the game to the public, I was able to ask a myriad of questions to Matt regarding the game's development, gameplay, and much more. Phil Stortzum: First off, who is on the development team for Cards and Castles? What are their functions on the team? What backgrounds in gaming does the team have? Matt Siegel. : I'm lead designer and developer with 7-years of professional experience doing software engineering, game design and balance for a variety of studios including Disney Interactive. Dylan Marquez, art director and game designer. He’s responsible for much of the art in the game and all of the UI. He's worked in games for 6 years as a game designer, UI designer, 2D artist, or producer. He's also a game development teacher, an active community leader, and has a real passion for games. Phil: Where did the inspiration for Cards and Castles come from? How did your team decide that this was the game that you folks wanted to make? Matt: I really enjoy making strategy games, and I felt the combination with collectible cards was a natural fit for the genre. I did all the initial prototypes and development before bringing on a team to round out the game. Phil: What makes Cards and Castles stand out from other games of its type and genre? Matt: We are a genre combo that hasn’t really been explored too deeply yet, so that alone makes us unique in the current market. Scrolls is probably the most well known attempt at this mashup but it didn’t catch on for different reasons and is being shut down by Microsoft. We’ve put a lot of work into retaining simple mechanics that interact in complex ways and are expertly balanced. I have a background in theory crafting, I was a spreadsheet master before I was a professional game dev, so you can expect a competitive and balanced atmosphere. You can also expect a lot of fun mechanics and awesome card combos! Phil: When did development for Cards and Castles begin? Matt: More than 2 years ago, as a prototype for a turn-based RTS. Yes, I know what that acronym means. I had a very different idea of what I wanted to do when this whole thing began. Phil: What was the most difficult part of development for Cards and Castles? Matt: The interface and controls. Seriously, you always feel like you could be a little more intuitive, a little easier to get in and play and understand immediately, and a little more information you could be showing. And the more information you show, the harder it is for the player to learn! Phil: The different amount of cards is one of the most impressive aspects of Cards and Castles to me and likely a lot of other people. How difficult was it to balance the cards so no card is significantly more useful than the others or deemed as overpowered compared to other cards? Matt: It’s a big challenge, but we have a robust numeric framework that estimates the relative values of cards on a common scale. Once you have everything lined up pretty close to where it needs to be, playtesting will inform the rest of it. We’ve learned a lot of lessons from games of the past and are applying them here! Phil: With so many cards available, do you worry that Cards and Castles will take some players a lot of time to learn the game and learn the ins and outs of each card? Matt: Not at all. We plan to add many more cards, and when we feel like we have too many cards we will probably move to a ranked format that cycles out cards on a yearly basis, much like other TCGs, so that the card pool does not become overwhelming and impossible to balance. Phil: Being a collectible card game, what kind of deck do players start out with during their Cards and Castles playing career? How are cards added to their collection? Matt: You start out with a basic set of starter cards for the Viking faction, which is a simpler faction based around unit strength. You get a lot of units to start. As you play other factions, you level them up which gives you starter cards rather quickly. You also earn points which can be used to get free booster packs. There are also simple single-player scenarios that award cards too! Phil: How will you keep players engaged with Cards and Castles for the long haul? Matt: We have a lot of new cards and single player content coming out soon! released in a future Cards and Castles expansion! 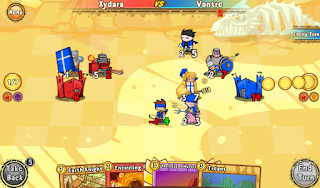 Phil: Cards and Castles has a very pleasant, uniform art style. How did your team decide on the art direction of the game? Matt: I’m going to hand this one over to our art director, Dylan. Dylan: Early in our process we were using Flash prototypes. We wanted an art style that would be Flash friendly, so we studied a lot of other popular web and flash artists. Ironically, we thought this game's visuals would be more serious, but found this type of art relied on visual humor and sarcasm. In that sense much of our world designs are self-ware and derivative of that style. It took us a long time to build our own style, but we ended up with an art and animation direction that is both playful and serious, which fits the gameplay perfectly. Phil: Who is the primary demographic for Cards and Castles that you’re hoping to lure in and excite right out from the gate? Matt: Everyone! Seriously, we’ve put a lot of work into making this game fun and accessible while retaining great depth. It’s easy to learn but hard to master! But if I had to pick some people, I’d say anyone who’s ever enjoyed a tactics game or a trading card game will be really excited by Cards and Castles. Phil: How does it feel to have Cards and Castles’ initial development behind you? Matt: It’s a big relief! No more 80 hour weeks. And we are all incredibly excited to have people get at our new game! A big thanks to Matt Siegel and other members of the Cards and Castles team for taking time out of their launch preparations to answer my questions. 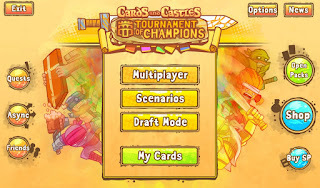 Cards and Castles is available now for download on iOS (see here) and Android devices (see here).